As the clock struck 8 a.m. PST yesterday, the banhammer fell. In a mighty swoop, not one, nor two, but three cards in Modern became casualties in the latest round of DCI banned and restricted announcement. It was a banning on a scale we have not seen for years, taking out two dominating Modern archetype and resetting the power level of the format to pre-Khans of Tarkir level. Granted, concessions were made. The good ol’ grave troll were released from the DCI’s prison, but part of me wished that Wizards released the Troll just to indicate that the banned and restricted announcement was just one big trolling attempt. In the veins of Deathrite Shaman‘s ban last February, yesterday’s banned and restricted announcement aimed at shaking up the Modern format in anticipation of the upcoming Modern Pro Tour in Washington, DC. The ripples of this year’s bannings will definitely be felt as two tier one incumbents were nudged off their seats in the Council of Tier One Modern Decks. Coupled with the unbanning of a popular card, the financial implications could span across a multitude of cards. Travis Allen (@wizardbumpin) would be discussing the changes in his article tomorrow. My article today will focus on a few cards I am very familiar with, a few cards which in my opinion, stand to be the biggest winners of the latest round of bannings. Those cards are related to a particular archetype that was marginalised in the post-Khans Modern landscape. UWR Geist, or Jeskai Geist as the nomenclature goes in 2015 was the first successful tempo deck in Modern. The archetype debut on Magic Online when Larry Swasey, better known as Krazykirby4 on Magic Online took down a Magic Online PTQ in the middle of January 2013 with an innovative new brew. It was at the height of Jund’s dominance, shortly before Bloodbraid Elf fell under the banhammer. To put it in Larry’s own words, that deck was a monster, and it propelled both Larry and his friend Brandon Large who was running the same list, to the finals of that said PTQ. It was a deck capable of attacking efficiently on multiple angles, a hallmark of good modern-day decks as Gerry Thompson encapsulated recently in a very insightful article. UWR Jeskai Geist garnered widespread attention a week later when Mitchell Manders took down Grand Prix Bilbao with a 75 that was mostly similar to Larry’s masterpiece, dispatching a Jund piloted by the formidable Lukas Jaklovsky. Jeskai Geist was inducted into the hallowed halls of tier one Modern decks. One does not simply disregard a deck that could take on pre-nerf Jund, the fairest of fair decks, in one-on-one combat. Unfortunately that was exactly what happened. Jeskai Geist faded into obscurity, only to surface again a year later when Vjeran Horvat won Grand Prix Prague with Jeskai Geist in January 2014. Jeskai Geist proponents rejoiced. I may not be a strategy writer; heck even my strategy credentials are lacking – I do not even have a single PTQ top 8 under my belt. However, I have been playing Jeskai Geist in real life and online pretty much since Larry Swasey took down the Magic Online PTQ in January 2013, and it was my go-to Modern deck up to the point when UR Delver upstarted it thanks to Treasure Cruise. I like to think I have a decent grasp on Jeskai Delver; at least good enough to 4-0 a couple of Modern Dailies. And I like to think that Jeskai Geist was one of the biggest winners from yesterday’s banned and restricted announcement. Prior to Khans of Tarkir, Jeskai Geist was the de facto tempo deck in Modern. After Treasure Cruise entered the metagame, Jeskai Geist found it difficult to compete with UR Delver’s raw speed and ability to refuel with Ancestral Recall (though Jeff Hoogland did top 4 a StarCityGames Modern 5K with an updated Jeskai Geist list that incorporated two copies of Dig Through Time). When Deathrite Shaman was banned in February 2014, the tier one deck that became the hardest matchup for Jeskai Geist was Birthing Pod. While Jeskai Geist could trade resources on parity with Pod decks, a resolved Birthing Pod often pushed the game out of reach, more so in game one where Jeskai Geist does not have an answer to a resolved Birthing Pod. To make matters worse, Pod decks could sneak a Birthing Pod under Jeskai Geist’s Mana Leak or Remand on turn two if the Pod deck is on the play. Or catch a Jeskai Geist pilot unaware during game one. Birthing Pod was one of the toughest matchups for Jeskai Geist back when I was grinding Modern Daily Events. With Birthing Pod out of the equation, Jeskai Geist has a good chance to be very well positioned in the metagame. How about Siege Rhino? Siege Rhino is not too much of an issue in my opinion. One of the worse things you could do against Jeskai Geist is attempt to resolve high casting cost spells. Jeskai Geist capitalises on tempo and it is a huge tempo swing for Geist to Remand or Leak a four mana spell, or even just Path to Exile it. Hopefully by now I have made a convincing argument that Jeskai Geist is the Next Big Thing New Old Big Thing. Let’s have a look at the key components of Jeskai Geist with financial potential. The Geist of Jeskai Past, soon to be the Geist of Jeskai Present. Geist of Saint Traft is sitting at $14. Let that sink in for a while. $14 is pretty much the lowest ol’ Saint Traft’s spirit has ever been. Geist is probably the frontrunner for potential financial winners from the 19th January Banned and Restricted announcement. Geist barely escaped an upcoming reprint in Modern Masters 2015 and was last year’s WMCQ participation promo. It is highly unlikely to see a Geist of Saint Traft reprint in the near future. 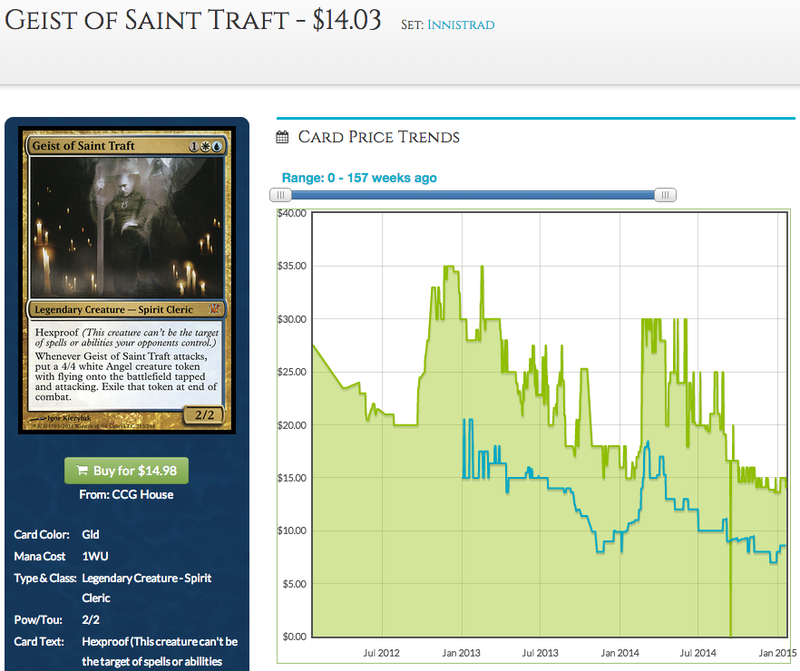 At $14, Geist of Saint Traft can only go up in price. 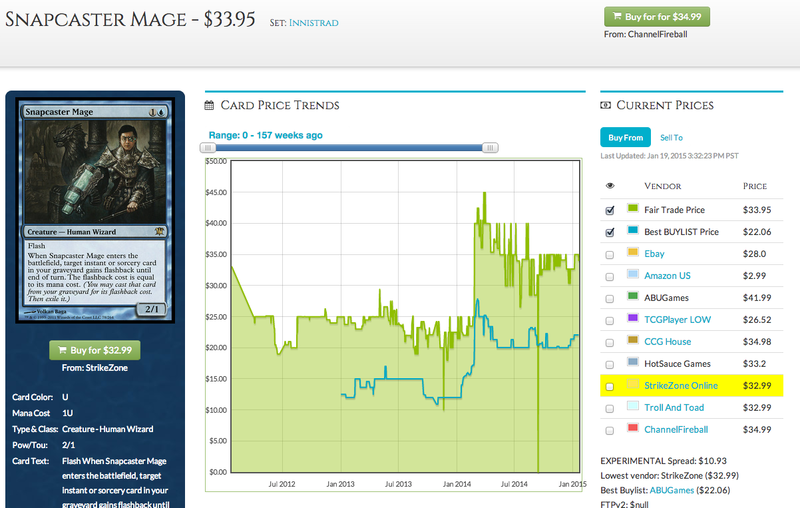 He is already $21 on Magic Online and has started to trend up since the announcement. My speculator’s ears always perk up when I see a digital card being significantly more expensive than its paper counterpart. $14 is a sweet price to pick up a mythic that is a four-of in a potential tier one Modern deck, and also offers hexproof against near-term reprints. Dealing out heavenly justice since 2010. A beauty in the design of Jeskai Geist is the deck’s ability to play both aggro and control roles efficiently. An early Geist of Saint Traft closed games in a quick fashion in tandem with Restoration Angel and the occasional Thundermaw Hellkite. An early Geist backed by a flurry of removals and burn does the job too. After all, Geist was considered to be an honorary red card by no other than Burn maestro Patrick Sullivan. Shall the draws or the matchup demanded that Jeskai Geist plays the long game, the deck could trade removals and out-card advantage the opponent while Celestial Colonnade slowly chipped away at the opponent’s life total, four at a time. While Colonnade is the other four-of win condition in Jeskai Geist, it is not a good pickup at $18, even though it has been trending down. 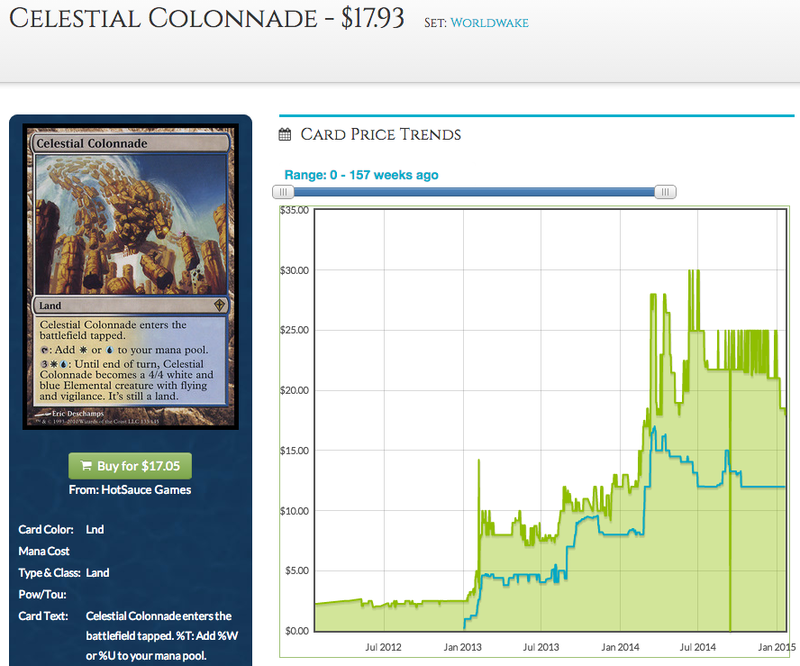 Celestial Colonnade has a near-certain probability of being reprinted in Modern Masters 2015. I would steer clear of Celestial Colonnade. Geist of Saint Traft’s other angel. He was quite the Casanova. The price of Restoration Angel continues to baffle me. The Swiss Army knife of an angel is still a sub-$10 card despite the amount of play she saw in Modern. She was found in all iterations of Pod, in Death and Taxes and also the occasional UWr Flash. Restoration Angel is one of the most versatile value creatures in Modern: she resets your Kitchen Finks, protects your Geist of Saint Traft, rebuys Snapcaster Mage and a plethora of other creatures with enter-the-battlefield effects. Not to mention she combos with Kiki-Jiki, Mirror Breaker for infinite angels and is a formidable beater by herself, being a 3/4 flying creature with flash. 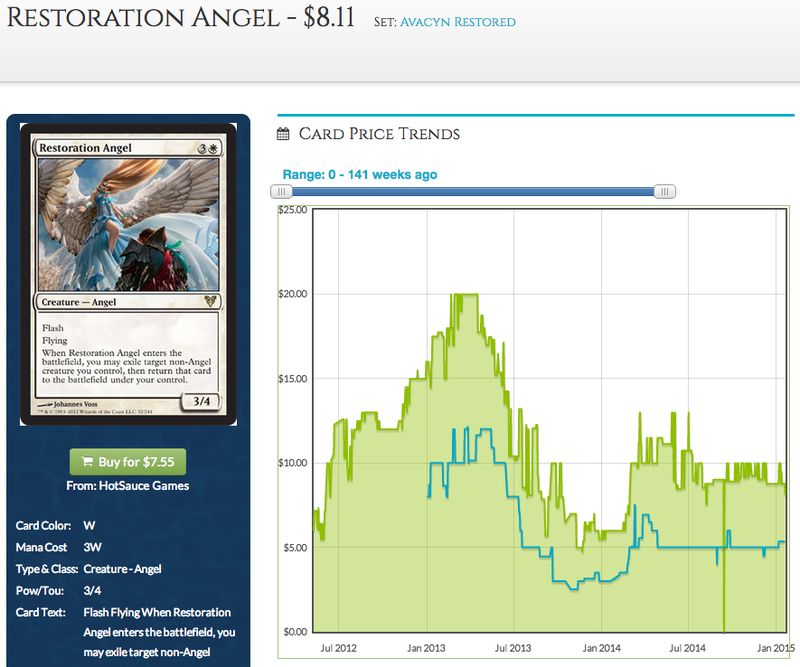 I suspect Restoration Angel’s price will suffer a bit of a dip due to the Pod ban if Pod’s value shell proved to be unviable in a post-Pod world. If that scenario happens, it would probably be a short-lived dip as Restoration Angel is not going to be in Modern Masters 2015. 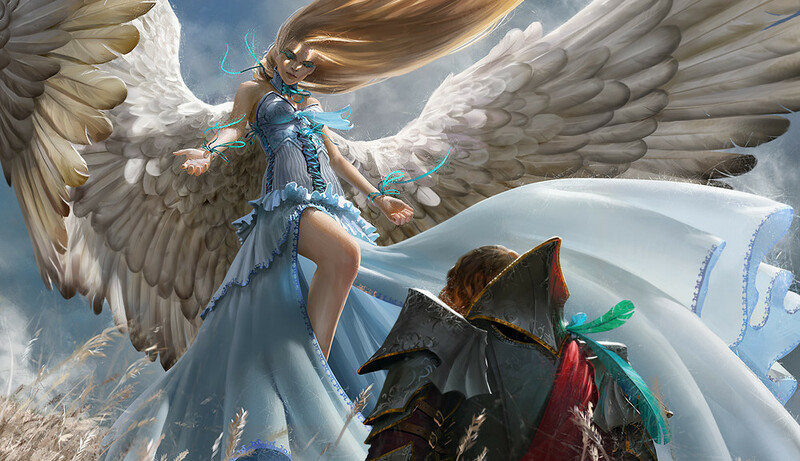 Restoration Angel has the versatility to fit easily in plenty of other archetypes and it would only be a matter of time before another archetype picks her up from where Pod left off (on top of the archetypes that are currently running Restoration Angel). $8 feels too low for a card this powerful and versatile and is unlikely to be reprinted soon. Even if you do not plan to spec on her, it might be prudent to pick up your own playset while she is at $8. The mother of dragons. Well, the mother of playable dragons. Thundermaw Hellkite was the ideal curve-topper for Jeskai Geist and Jund back when Lingering Souls was running rampant in Modern. Jeff Hoogland eschewed Thundermaw for Stormbreath Dragon and Vjeran Horvat mentioned about replacing Thundermaw with another Restoration Angel or Cryptic Command in his post-Khans of Tarkir list that narrowly missed top 8 at Grand Prix Milan. Thundermaw’s position in the deck and the Modern metagame is meta-dependent. If Lingering Souls sees a resurgence in the new meta, Thundermaw would once again be the five-drop king of the sky. 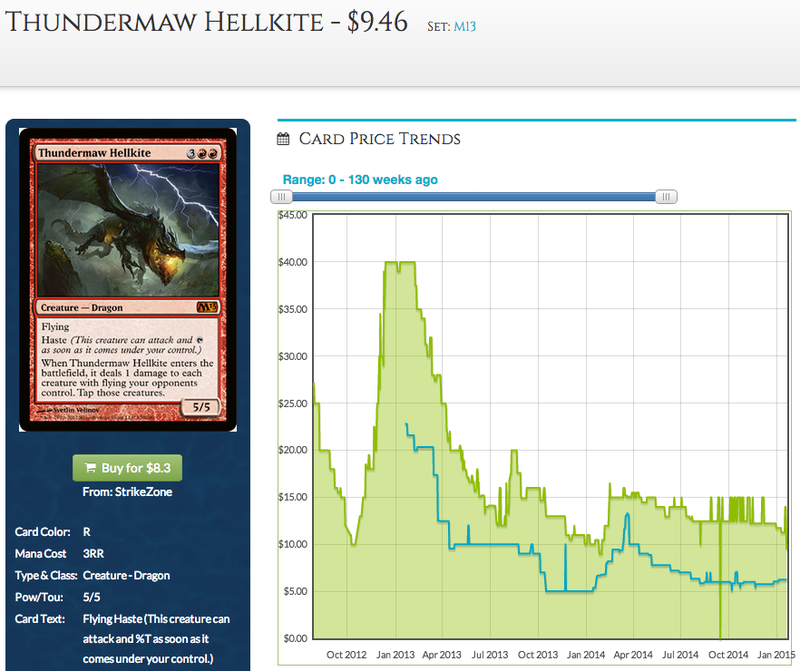 I would not recommend buying as many Thundermaw Hellkites as you can at $9.46. It is quite possible to see Thundermaw reprinted in Magic 2016. It is the perfect foil to Hornet Queen and could appear as a pre-planned safety valve in Magic 2016. Keep an eye on Thundermaw; it might be worth moving in on Thundermaw at under $10 if Lingering Souls is widely played in the upcoming Modern Pro Tour, but don’t spec too many copies or sit on it for too long due to its short-term reprint risk. The leading cause of unintentional draws. Both Jeff Hoogland’s list and Vjeran Horvat’s list ran two copies of Dig Through Time as late game card advantage trumps. With Dig Through Time out of the game, Jeskai Geist will probably revert to the old faithful, Sphinx’s Revelation. 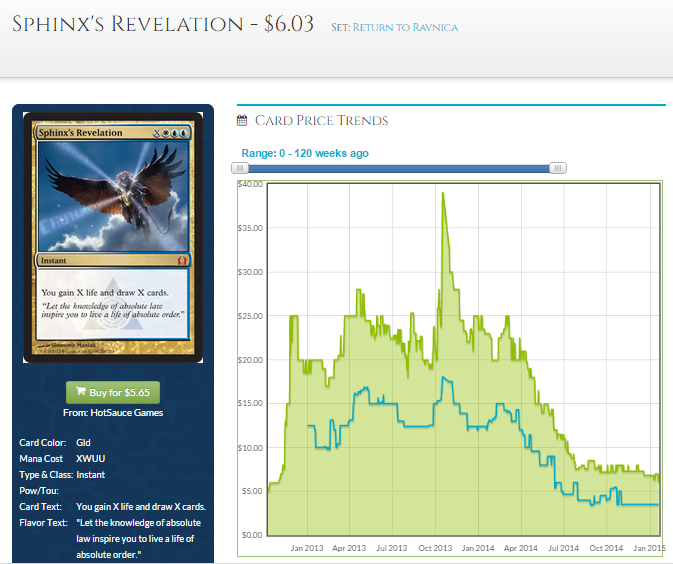 Sphinx’s Revelation is a good pickup at $6. It is a Modern playable mythic that is unlikely to be reprinted in the near-to-medium-term as Return to Ravnica rotated out less than half a year ago. Snapcaster tried his best to do an impersonation of Yawgmoth’s Will. He really did. In the midst of the furore of yesterday’s shocker of an announcement (don’t pretend you were not suprised too), Snapcaster Mage nearly slipped my mind, until Redditor and moderator of the mtgmarketwatch subreddit /u/mtd14 reminded me that Snapcaster is among the winners from the bannings. I could not agree more. Snapcaster’s numbers suffered a decline in the wake of Treasure Cruise, because jamming Ancestral Recalls is plainly better than pseudo-Yawgmoth’s Wills. Now that we can’t Ancestral Recall in Modern anymore, Snapcaster Mage will probably be present in higher numbers again. A Jeskai Geist resurgence would also increase the demand of Snapcaster Mage as the deck runs a full playset of Snapcaster. More importantly, Snapcaster is the most played creature in Modern being present in 31% of Modern decks in 2014 at 3.2 copies, despite Treasure Cruise suppresing his numbers during the recent months. And he is not going to be reprinted in Modern Masters 2015. $34 is a rather low figure for the most played creature in Modern (and Vintage) with no reprint in sight for the near future. The only real risk of reprint for Snapcaster before the Modern Masters after Modern Masters 2015 is being minted as a Grand Prix promo, but we could rest assured that it won’t happen until at least December 2015, with Griselbrand being the 2015 Grand Prix promo. Chord of Calling. Kiki-Chord is a potential direction for Kiki-Pod decks. Chord of Calling is just $3. Domri Rade. Kiki-Pod once ran Domri Rade as an extra value engine. $7 is not cheap, but if he (or she) replaces Pod as the deck’s value engine, I am sure Domri would not be in the realm of single-digit price tag. Previous PostUncommons and Commons of Fate ReforgedNext PostHelp us build the ultimate MTG mobile app! Good stuff – enjoyed the read. Am slightly less bummed out now, though I still think banning Birthing Pod wasn’t needed. Oh well. Any thoughts on Voice of Resurgence now that Pod is out? Do you think it will drop? It’s hard to predict the direction of Voice of Resurgence. In a vacuum, Voice of Resurgence is still an insane value card for Modern (three abilities in a 2cmc creature? Why not) that could potentially fit in a swath of creature-based strategies. I can’t give you a firm answer as I do not know Voice’s direction myself. If Voice does not find a home within the next few months it might experience a drop, albeit a temporary one I’d imagine; its one of the most powerful two-drops in Modern. While I can’t tell you the direction of Voice, I can tell you my plan for Voice. If Voice drops below $10, I am hoovering up any copies I can find. Hope it answers your question, or at least bits of it.